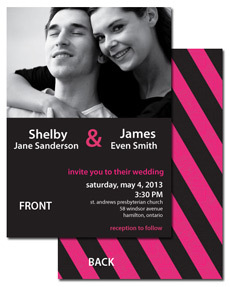 Invitations are available in a variety of styles, paper types and colours to suit your tastes. Book an appointment with our sales representative to discuss your requirements. Panel cards are double-sided invitation cards printed in 4-colour and typically include a photo or graphic and your prepared text. The back is printed with a complementing pattern/graphic and can include text or photos. Includes standard 5.25″ x 7.25″ envelopes (white only). Pricing varies with paper type and envelope. Cards can be custom designed and printed with a bleed (to edge) or without a bleed. Paper/Finish: Printed on 10pt card stock, matte of gloss and available in a variety of paper types and colours. Options: Single-sided or double-sided. With or without bleed. Variety of paper colours and finishes. Many typeface options. Envelopes: Price includes standard envelopes (white only). Matching/contrasting envelopes available in a variety of colours.